Operate comes preconfigured with many reports on the most important data that you might want to extract from within the system. However, you have the possibility to create your own reports, according to your specific needs. Let’s see how to create a new report. For the purpose of this guide, we will create an Accounts and Invoices Report; however, the principle applied here are valid in any other report that you might need to create. Start by going to the Reports section within the main navigation menu. You will now see the list of available reports. Click New at the top of this list to start creating a new report. Next, chose the category/module to which your report belongs. Click the "+" sign next to the module name. This will reveal a list of subcategories. Click the one you need to get to the report editor, where you can set up different parameters of your report. The Report Editor comprises three main areas: The name and location settings for your report. 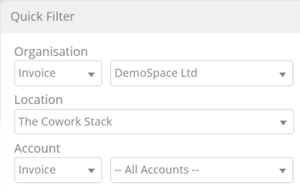 the filters, the report preview and field editing area. First, name your report and choose in which folder you would like to place it. This helps organize your reports more comprehensibly and makes it easier for your to find and access them. Next, add filters to your report. The filters represent the criteria that your data needs to meet in order to be displayed on the report. When updating a filter, the report preview below will automatically update according to your changes. The only exception is the Advanced Filters area, which you need to apply yourself in order for it to update the preview. Start with the Date Filter - Choose a Date Field - This is the main date upon which your data will be based. For our example, we have chosen the Creation Date, which represents the date when the account/invoice record has been created within Operate. The Date Range field lets you predefine a date range or customize it according to the dates you need (as we have done in our example). If you have set a Custom Date Range, then the Date From/To fields will be enabled, so that you can chose the period within which the report should be generated. Add Quick Filters - Here is where you can further narrow your report down by selecting specific elements that you would like to see on your report - in the case of our example, an organization, location or account. These quick filters will be different, depending on the type of reports that you are running. Apply your filter when you are ready. This will update the report preview below, according to the advanced filters you set. Read more about using advanced report filters in Operate. Preview your report and edit its fields - You can do so in the report preview section underneath the filters. For a better view of the preview, you can toggle the filters section on and off your screen by clicking the orange line in between them. Edit the columns that appear on your report, by dragging fields from the right side area of your screen, onto the report. Click the field you need, then drag it onto the blue header area in the preview. You can add the field in between any pre-existing columns, simply by placing the cursor where you want it to go. Use the Search box on top of your field list to find what you need faster. Here is an example of how you can add an Account Type column to your report. Click the small arrow sign next to a column header to reveal sorting and grouping options, as well as the option to remove the column from the report. You can use the Remove All Columns button at the top of the preview, to start your report from scratch. Use the Tabular or Summary options at the top to create your report as a detailed one (Tabular) or a Summary. When you are happy with your report configuration, you can run or save it. Click the corresponding buttons at the top right to do so. If you click the arrow to the right of the buttons, you will have the option to both Run and Save your report (under the Run button) or to save your report under a different name (Save as, under the Save button). Please note that if you decide to run your report immediately, it will not be saved for future use. You can; however edit and save it after you have ran it. By using Save and Run, you will perform both tasks immediately. This is recommended if you want to make sure you save your report configuration and use it in the future.